Small - $12.99 Only 7 left! You came into the living room one day to find your kid watching Star Wars Rebels on Cartoon Network. You just thought you were going to check on him for a second. But then you got sucked in. You wanted to know what was happening. Then an hour went by. Then two. The cartoon might not be similar to the old movies, but you still liked it a lot. And your kid likes it even more. So much so that he had demanded to become part of the Rebel Alliance. You tried to tell him that it might not be that easy. He would have to start at the bottom of the trust ladder and work his way up. He wouldn’t get to do any of the really cool stuff for a long time. What if we told you he could though? 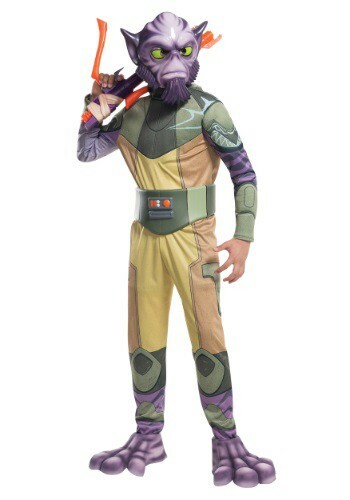 He could put on this Star Wars Rebels Deluxe Child Zeb Costume and instantly be an important member of the Rebels. Your little guy will be able to go on missions with his Rebel friends, smashing bucket heads, and coming to some hard conclusions about the enemy. Turns out, the enemy has reasons for doing what they did too. He might even get to be the one who finds the Lasat home world: Lira San. Your little dude might just be such a good fighter that the REAL Rebels will come looking for him…and the Empire too. Don’t be jealous, you can always pick up your very own Star Wars costume too, and have awesome adventures together.